ADDRESS: 3421 North Lakeshore Drive, Tallahassee, FL 32312. This is an executive home for your family on North Lakeshore Drive between Meridian Road and North Monroe Street. Good access to I-10. Close to shopping and services! 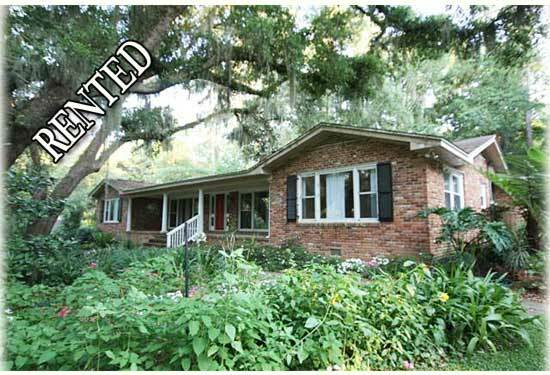 UTILITIES: Tenant pays for all Utilities: City of Tallahassee, Television, Telephone, Internet, etc. Property Manager visits and changes Air Conditioning Filters Monthly. KITCHEN APPLIANCES: Range, Dishwasher, Refrigerator with Ice-maker, Microwave Oven, Washer and Dryer, Automatic Garage Door Opener and One Remote. LAUNDRY APPLIANCES: Washer and Dryer. Laundry in Garage. SECURITY DEPOSIT: $2,200.00. This is not the last month’s rent. GARAGE: Two Car Garage with extra Storage Room. Automatic Garage Door Opener and One Remote. PETS: Pets 45-50 lbs. may be considered. There is a Pet Application and Interview with the Pet. Pet Fee varies with the Pet ($250.00 minimum per Pet). This is Non-refundable. With pets, the tenant must have a Tenant’s or Renter's insurance policy addressing Pet Liability. AMENITIES: Light and Bright. Gleaming Hardwood Floors throughout; Tile in the Kitchen and Bathrooms. Screen Porch opens to back Patio and Private Backyard. Gorgeous Native Plant Gardens surround the House with Citrus and Blueberry Bushes! Between the North Monroe and Thomasville Road Commercial Areas. Close to shopping, restaurants, services, movies, etc.